My son took his three children shopping for a birthday present for their mother. Otherwise they would have nothing to give her. Miss M was in a wheelchair. The chemo attacks both good and bad cells without differentiation, so she still has very little energy. Her mother was very reluctant to let her out of her sight as she believes she is the only one capable of looking after her. More on that later. We were told not to even think about letting her get sick or we would have no contact again. I'm not quite sure how one "lets" a child become ill.
Miss M chose a large cushion with LOVE, one letter to a quarter of the kitchen. She wrapped it herself and enjoyed doing something which could be classed as "normal" behaviour. I had deliberately decided on very simple food. Baby sausages, normal sausage but the size of a cocktail frankfurt, mashed potato and corn. All favourites of hers. She ate quite reasonably and enjoyed everything. 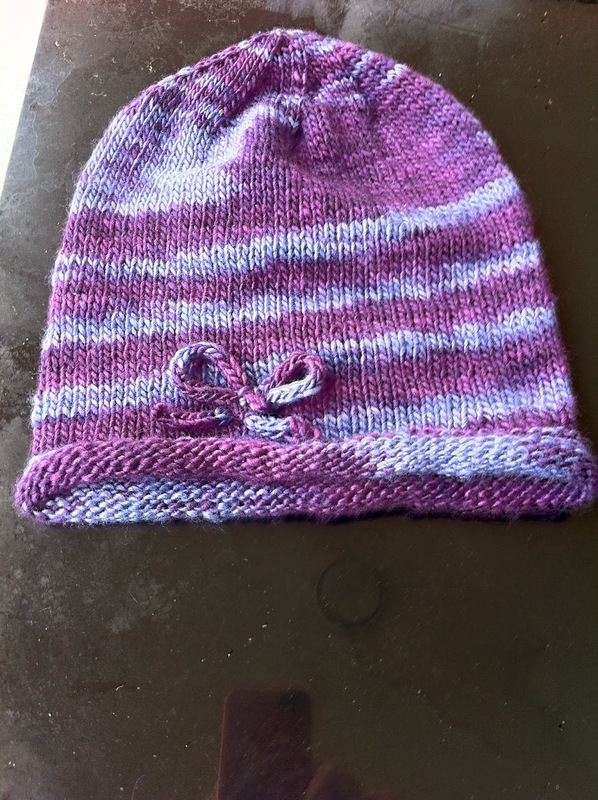 I had finished the Malabrigo silky/merino hat which is a good fit for her and ready for a cooler day. She loved it and it looked really good on her. It's very soft and she likes the feel of it. She told her dad that she doesn't like wool because it's scratchy on her scalp, but likes grandma's wool which doesn't irritate her. Something to be said for buying quality, I guess. Then again, I buy decent stuff because my fingers appreciate knitting it and I am then motivated to finish the knitting. I did an acrylic scarf a few years back for my nephew and could do only a few rows a day as the yarn burnt my fingers, leaving red marks. The yarn came from Renee at Suzyhausfrau. Great service as always. This hat is definitely NOT this colour. It's a pillar box red. I find reds difficult to photograph well and the shiny black table top probably did not help either. It's more yarn from Renee, this time a Debbie Bliss cashmerino which has merino, microfibre and and cashmere mix. Again it's very soft, a 10 ply weight so it was a quick knit. 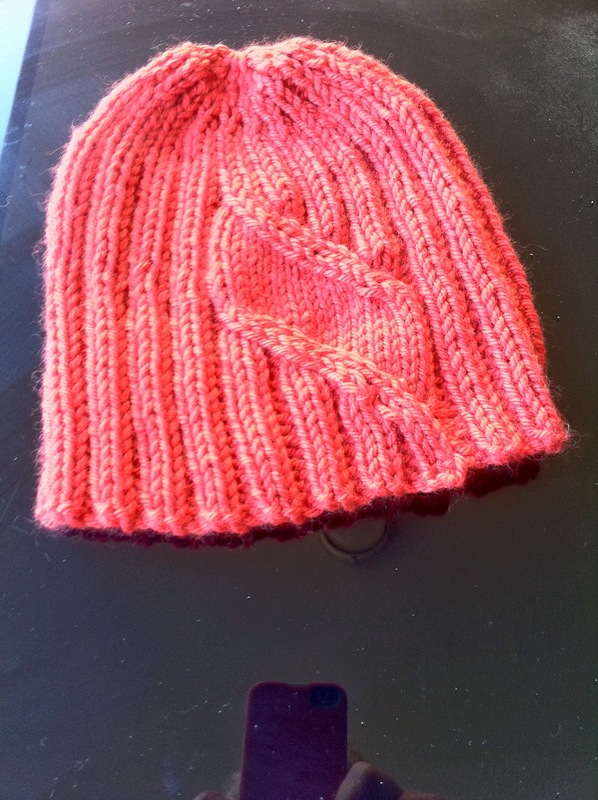 The pattern is called Simonside and is from an ebook of patterns of garments for children from head to toe. Hats, scarves, cowls, mittens and socks, all in many multiple sizes. Lots of different styles and the sizing is good too. Ravelry link to book. There's a link on that page called ALL PATTERNS to everything in the book. I bought this before I knew I would be making chemo hats. All my family regularly do the money raising for various cancers, relay for life, breast cancer, World's biggest shave, dry July, growing moustaches, Canteen etc. My son has shaved his head several times but this year there is a very personal reason for it along with his grandmother who had CLL, chronic leukaemia, often found in the elderly and she died of a stroke, just on four years ago. Last year his target was $500 which he easily exceeded. He's going for $2000 this year and is a quarter of the way there after just under two days. Some people in Melbourne with whom he has contact through work, have put together a group to do this as support for him. He has only ever spoken to them on the phone. How kind! Last Sunday afternoon, he and I went to another son's place at Daley's Point at Woy Woy. Lovely afternoon with an unhurried meal and lots of chat on his covered verandah with views over the water. Lots of sun and it was beautiful. The picture was taken late afternoon, but shows how restful the view is. He has steps down to a jetty and his children love to be down there. Tim has a lime tree on the place and we brought some home. They smell great as they are so fresh. 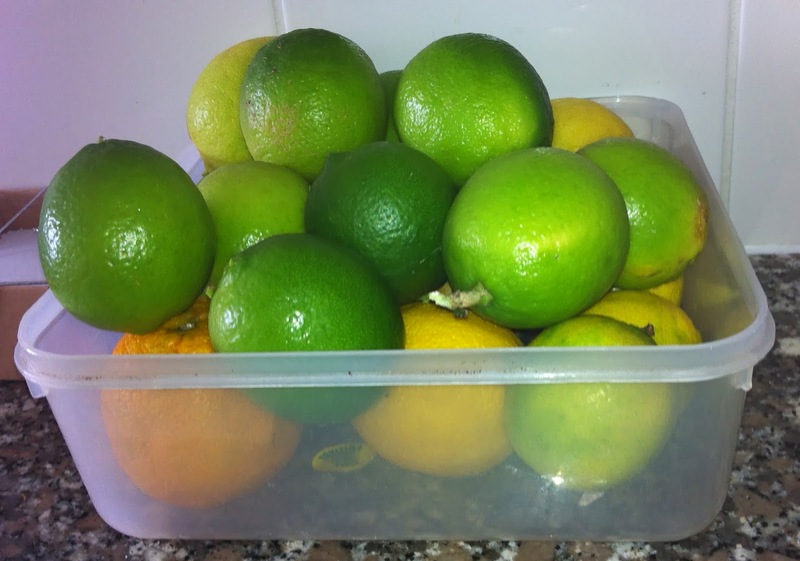 I use limes a lot in cooking and also in the occasional gin and tonic, a great summer drink. It was a pleasant break in what has been a stressful time. 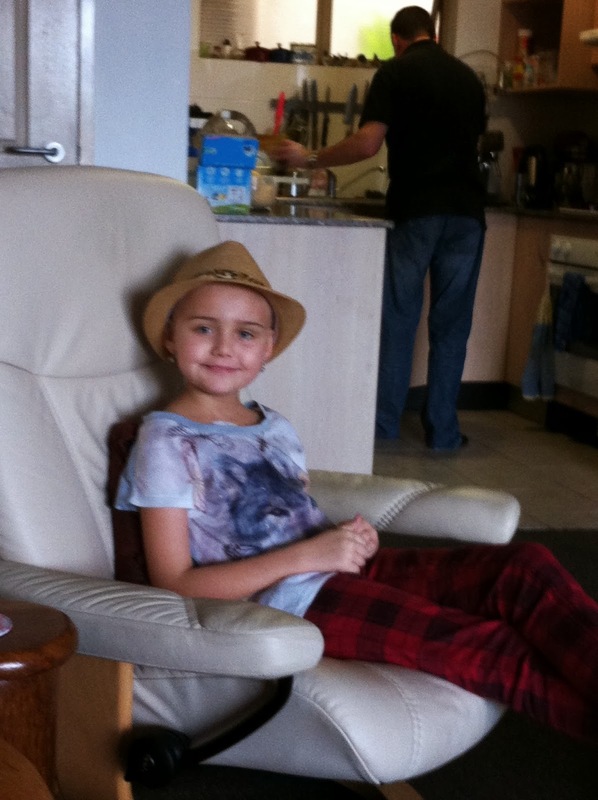 Miss M's tests show good results and numbers and she had the last of the second round of chemo yesterday. The third round goes for two months and will have several hospital stays involved during those weeks. Lots of tests, more anaesthetics and the main side effect of this lot is very severe, fairly constant nausea. Some people are just plain selfish. Last Thursday Miss M had another anaesthetic, central line flushed, lumbar punctures and bone marrow biopsies, then several hours of chemo and a blood transfusion. That made a rough day for her. We learnt later that her mother wanted to go see the Rugby League match on that night. So she went and took Miss M with her. So much for not exposing her to infection. Apparently even some of her friends whose advice has been of dubious quality protested about that, as they should have. Must get back to my knitting. I feel the need to be quietly knitting away. Son bought a bed at the weekend as the sofa bed is comfortable but not made for permanent use. He's been waking with headaches. The last few days have seen a major reorganisation here and my lounge room now has two lounges in it so the bed can go in the spare room. Spare no more. I support him totally, but it's certainly been a shock to the system. Some boxes of yarn have been dumped in my room. I will go through them, but they can wait a few days while I recover. And finally, in what has been a long blog post. Miss M's older sister fell at school on Thursday and broke her wrist. As the took her back to the home away from home at Westmead Children's hospital, Miss M brightly remarked how good it was that Mum could get cheap parking. Cancer patient parents get a parking card for $20/month. Casual parking cost almost $30/day. Her mum was not impressed by her brightness! There is a back cast and a bandage till swelling goes down when full cast will be applied. It never rains but it pours. Jan, this is hard for me to say, but I think this goes far beyond selfish. it is endangering the child's life - quite literally. I think the hospital should know about these actions. I can understand that you feel that Miss M. loves and depends on her inadequate mother, but the price could be very high. I strongly suspect the hospital has been told, but thanks for the concern. Even her friends were horrified at this. I am very sad to read about what has been happening with the outing. I know I try to stay away from dangerous germy situations, but Miss M needs extra special care. She looks so happy in the picture and how wonderful to have a nan who knits lovely hats with soft and gentle wool. Yum, limes. Yes, definitely a G&T!! Well, Miss M's older sister is definitely a glass half full person, she must be good to have around right now. Take care, sending wiggly Labrador tails. Sounds like Miss M is doing well despite her unnecessary outing to the football! I can see why their house didn't sell (God knew what was coming) and I'm glad for it. I'm also glad that He is totally in control, even though it sometimes doesn't look like it!